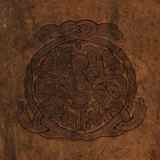 Arstidir Lifsins is an international Icelandic/German trio, which, while maybe possessing a funny sounding moniker, delivers very serious and somber pagan metal of the highest order. Vocalist Marcel (Helrunar) and guitarist/bass/multi-instrumentalist Stefan (Kerbenok) may have some black metal pedigree, and indeed Arstidir Lifsins dips into the blackened waters from time to time, but it is their Iceland-inspired folk that makes Aldaf?ðr ok munka dróttinn so outstanding. Do not even think about putting this album on if you are in a hurry, have a short attention span or look for a quick pulse-pumping danceable folk. Aldaf?ðr ok munka dróttinn is nothing of a kind. Instead, in long sweeping epic forays Arstidir Lifsins methodically tells the story of Iceland conversion to Christianity in the 1st century. At the forefront of this storytelling approach are profound layered deep-voiced choral chants, supported by viola and acoustic guitar underpinnings. For some these may be difficult to digest, but to me these often made best album moments (like the intro to Kastar heljar brenna fjarri ofan ?nundarfirðinum). Going even further at times, Tími er kominn at kveða fyrir þér basically delivers shaman-like incantations, and whether they come from an individual or a result of a number of voices, they make for the most authentic, and at the same time tragic, feeling on the album. To those who will call Aldaf?ðr ok munka dróttinn repetitive and samey I suggest reading Icelandic Sagas. These are reserved, long and drawn out pieces of literature, yet they contain some of the most passionate of emotions, describing generations of Iceland colonizers engaged in long lasting skirmishes and adventures. In Aldaf?ðr ok munka dróttinn one can relive these stories through the music. Fires can be heard crackling in the background, and it is so easy to imagine the desolate, stone-filled windswept native Icelandic landscapes, so dear to their inhabitants and so worth fighting for while listening to songs like Kn?rr siglandi birtisk á löngu bláu yfirborði. Besides the Viking chorals there are also spoken vocals, preacher sermons (Kn?rr siglandi birtisk á löngu bláu yfirborði), crow-like cackles (Kastar heljar brenna fjarri ofan ?nundarfirðinum) and Marcel’s black metal roars set to methodical steady double bass or lazy blasts. Yes, in between all of their pagan pageantry Arstidir Lifsins has black metal outbursts reminding of early era Enslaved and Borknagar, but then there is a good deal of Om and Nechochwen in them as well. The band absolutely excels connecting the harsh and the epic in some flawless transitions in Þeir heilags dóms hirðar, Bituls skokra benvargs hreggjar á sér stað and Sem lengsk vánar lopts ljósgimu hvarfs dregr nærri. Funeral buildups of Úlfs veðrit er ið CMXCIX, melody carrying the entire song through the double bass medium in Bituls skokra benvargs hreggjar á sér stað towards triumphant finish, and eternal feeling of Sem lengsk vánar lopts ljósgimu hvarfs dregr nærri are some of the enthralling moments of this seemingly endless, but never boring, album. The confident black metal outburst of Norðsæta gætis, herforingja Ormsins langa, which follows medicine man Tími er kominn at kveða fyrir þér, is almost welcome, but it is still the pagan epic compositions of Aldaf?ðr ok munka dróttinn which make this album unique. The warm production is inviting the listener to settle back and transfer the mind somewhere way back in time and place. Aldaf?ðr ok munka dróttinn is actually 2 disc 80 minutes worth of music, but once, or should I say if, you figure it out you will not want it to end anyway.